Over thirty years have passed since your grandfather, Samuel Silverspring, disappeared without a trace. When a mysterious letter arrives claiming to have insight on your grandfather’s whereabouts, you are led back to the place he was last seen, Graves Mansion. 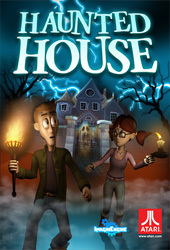 As you dare to embark on this spooky adventure to uncover the truth about your grandfather, you are forced to face your fears in the dark depths of the Haunted House?